This order is for one sheet of 20 2" round glossy stickers. 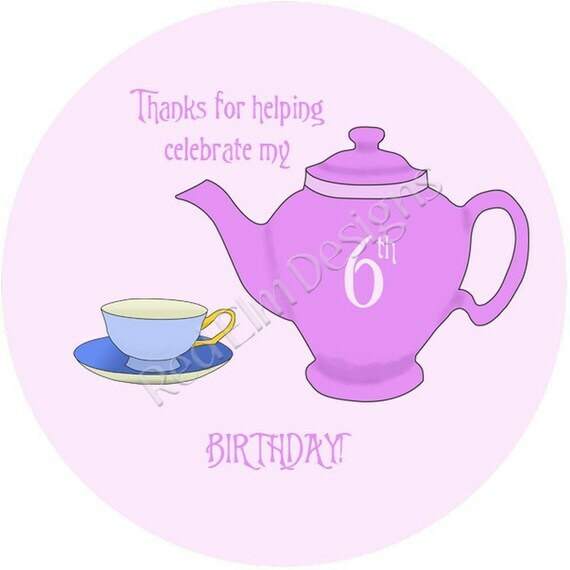 These stickers feature a tea party design and are perfect for party gift bags, wrapped gift decorations, envelope seals for thank you cards, use on cupcake toppers, and more! The stickers are adhesive backed. Note for customized stickers - Within 48 hours, you will receive a proof image of the stickers. Your order will ship via first class mail within 3 business days of your approval unless otherwise stated during the ordering process. Additional sheets can be ordered using by changing the quantity ordered, or please contact us if you need more than are currently showing available. All of our stickers feature original and/or licensed art and are 100% customizable for your specific needs. If you would like to customize the text, add names, or change colors, or even create an entirely new design, please contact us for a custom order. Stickers could present a choking hazard for small children are intended for children 3+ and up. Our items are made to order. Normal non-customized orders will be shipped within 3 business days. The default shipping is for first class mail, which normally takes 2-5 business days (not guaranteed) depending on your location in the US. Priority mail or other shipping methods are available if you need the items more quickly - just contact us and let us know that and we will create the order for you. Please check out our crayon shop at http://redelmdesigns.etsy.com for custom crayons for your party!